Starting with some ominous weirdness, a slow burning open section, the melodies slowly enter into a nicely woven tapestry of sound. The only vocals present are the sample at about the midway point which captures the feel of the track. The whole of the song feels like it's building to the heavy bridge section with solid rhythm guitar and some tremelo picked verbed out post-black metal lead guitar. The middle track “In Death of Space / Of Death In Space” starts the intensity right off the bat with some noise, under tremelo picked leads. I like how Liquido Di Morte has integrated a blackmetal/gaze feel into a more psychedelic outing, the layering they incorporate also adds an extra degree of unease and this track begins feeling like a backing soundtrack to an alien invasion. At the 4:30 mark or so, the track opens up into some nice melodies over some nice bass playing and solid drumming. The final two minutes of this track are in my opinion the highlight of the album and channel some heavy classical vibes, with a consciousness expanding guitar noise freakout over a frantic repeating melody figure. “144” begins with an ambient wash of cascading noise over some jazzy drumming, ending with what sounds like aliens trying to contact us from space. At about the 3:20 mark the drums kick into an ominous slow build, the guitar kicks in with an Earth-esque riff with some cool ambient droning, oscillating in the background. This song has a lot of repetition and layering and all the melodic passages are VERY long and similar to a YOB composition. This repetition helps set a deep atmosphere and this track especially should be listened to in an album context and as a complete work. A very historical sounding sampled vocal, sounds vaguely like the Nihilist’s fake American accent from the Big Lebowski movie and breaks up the middle section of the song a bit. The keyboard weirdness near the end of the track is pretty cool and it almost sounds like someone screaming into a vocoder while spinning all the knobs on board at the same time. 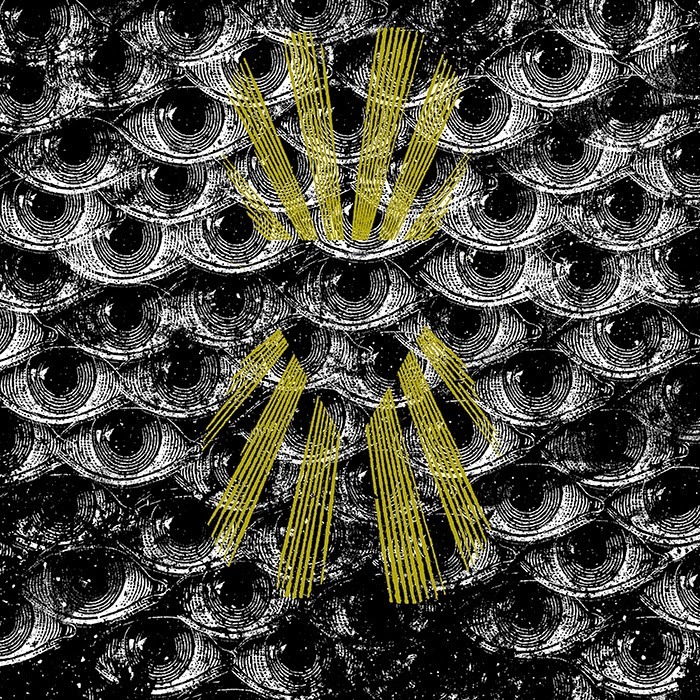 I feel like the artwork here is definitely cool enough to warrant a mention, Liquido Di Morte's artwork has an Illuminati-esque feel with a repeated all-seeing eye motif and some yellow rays that seem to be radiating from an outline of an upside-down pyramid. Anyway, it looks pretty badass and an album this intense should have intense artwork to match. I had this album in the car over the weekend before reviewing it with several others and I found myself listening to it more than the rest. It's a definite grower with many layers and Liquido Di Morte has developed an excellent and unique sound. Check it out below and if you have the time and live in Europe see them live too, because I can tell that these songs will be amazing.